If you are a hip, trendy, and groovy person, then it is the ring for you. It has a very distinctive design which will bring you energetic life every day. I bought this ring as my fiance's wedding ring and we both love it! The size is right, the color is right, and the grooves give the ring that masculine quality my guy was looking for. 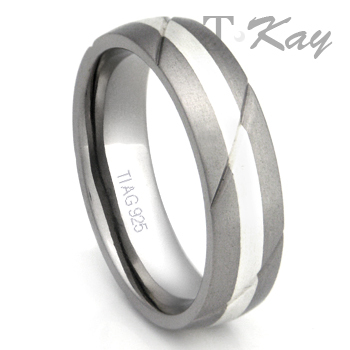 We also love the titanium because, unlike tungsten, it can be cut off in an emergency which could happen easily in my fiance's line of work. We are very satisfied! Just recently recieved what is to be my wedding ring. After recieving the ring I had to send it back as it was too big. There were abosolutely no problems in exchanging it and the new ring fits perfect. Will do business again. My wife and I chose these matching bands for our wedding bands and so far, we have not been disappointed. These durable rings hopefully will outlast us. We look forward to recommending your jewelry to others as well as doing more business with you ourselves. Thank you!